Configuring a router sounds like a tough task. Routers are capable of sending and routing data on a dynamic level- no easy feat. But with this article we are only getting our feet wet. 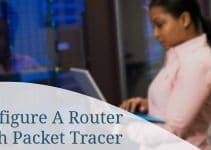 We will take a look at how we connect to a router via the console port and setup a HyperTerminal session to configure the router directly. All you need to get started is a Cisco router with a console port, a rollover cable, and console port on the PC being used to program the router. Note that you’ll most likely need an RJ-45 to DB-9 adapter if your PC’s console port won’t fit an Ethernet cable. The Cisco Internetwork Operating System, referred to as the IOS, is the operating system of the router. It is a proprietary kernel that performs the routing, switching, internetworking, and other telecommunication features. Keep in mind that there are many different Cisco routers that have been developed. With each release, there are updates to how the router functions and accepts commands. You should note that some commands will differ from router model to router model- but we’ll get more into this later. The differences aren’t too great, so there shouldn’t be too many troubles with this aspect. Actually connecting to the IOS via our desktop requires special software. What we will use in these examples is HyperTerminal. It is very likely you already have it. Windows users, for instance, will find it in their Accessories folder under the Start Menu. (From there it may be listed under a communications folder.) Note that Windows Vista users did not get blessed with HyperTerminal, and so thus it must be downloaded (for free) here. 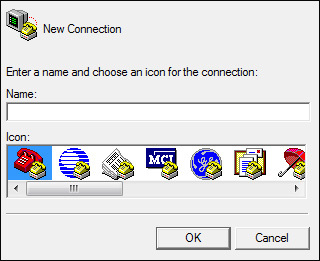 Start up HyperTerminal, and enter any connection name in the window that appears, then press OK.
Now in the resulting screen, make sure the COM port is selected next to the “Connect Using:” label. Press OK to go to the next screen. Also make sure all checkboxes are unchecked. Now when you press OK, you will be presented with a new dialog. 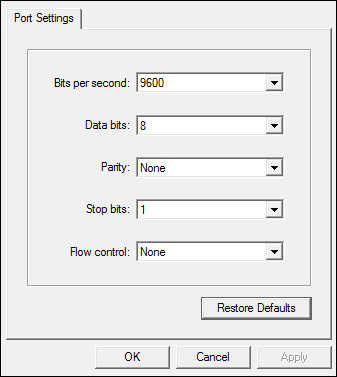 Be sure that you click “Restore defaults” or else the wrong configuration may be loaded. The final result in each textbox should mimic the textboxes in the following screenshot. Now press OK. Now to show the power-on self test, or POST, power your router off and power it back on- if the screen begins cluttered with information, you’ll know everything was a success. If nothing happens, check to see if your physical configuration is right. (A rollover cable from your PC console port to the router console port- which may require a RJ-45 to DB-9 adapter.) Also check to see if you followed the HyperTerminal instructions correctly. Lastly, make sure you powered your router off and back on correctly. What you should be seeing is the power-on self test, or POST. This is a set of tests and checks to make sure your router is configured correctly and is running without problem. It can be a few minutes before it is complete, so have patience. Note that if you are asked to enter a setup configuration, type NO and press RETURN. Eventually you will see a “Press RETURN to get started!” prompt. Simply press enter and you’re done- you have successfully connected to a router via the console port. Now the fun part begins: configuring the router! 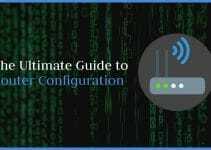 In the next section we will take a look at some basic router configuration commands. 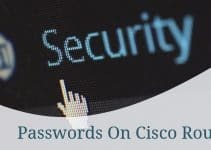 We will be creating passwords, modifying running configuration settings, and starting an introduction into the wonderful world or router configuration. when will be the second session start, of its possible can you pls email me the entire artcile which teaches how to configure router, and all the needed information for learning how to configure router, your article on subnetting is simply superb, it helped me to learn subnetting in just few minutes. thanks a lots once again. This is good, I hope you will put up more of these articles – that are easy to use.